Does your horse stop drinking when you trailer him to your events? 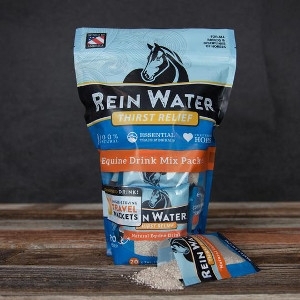 Rein Water is a great tasting electrolyte that will keep him hydrated and give you peace of mind. Rein Water is an all natural powder drink additive that encourages horses to drink more while providing them with natural electrolytes. The natural ingredients come from Redmond’s mineral deposits in Central Utah and are brought to you in their natural, unrefined state, full of beneficial minerals.